@ Lands Annex - I hope you are satisfied with the big gun in this installment! Moments later a roaring wave of thunderous flashes ran along the wall top as the leadbelchers gave fire. Seven dwarfen thunderers fell, as well as a Brabanzon spearman. The dwarfs barely flinched, however, instead gritting their teeth and continuing to prepare their pieces. The rest of the assaulting army continued their advance, with the flying machine zipping over their heads, its pilot considering where exactly he could drop his grenade. After saying ‘Excuse me’ to the fellow who had helped her to remain on her feet, Perrette held forth her hand to present her ruby ring to the walls, and with a brief word of command conjured a ball of fire to burst against the parapet holding her attackers. Not satisfied with merely singing them, she immediately summoned another fireball to follow and this time one of the leadbelchers fell screaming from the tower, his large flask of powder exploding even before he hit the ground. The men with her gave a cheer, to which she, despite the pain from her wound, replied with a curtsy! As the sound of the cheer died, it was replaced by another, and although the choir behind the sound was rather smaller, they were no less elated. The Brabanzon’s trebuchet had landed a stone on the damaged wall, and in so doing pierced the first hole to go right through it. Its crew whooped their delight, then shouted across to the dwarfs to get a move on and ‘finish the job off’. Granite Breaker was not quite ready to fire, and so one of the smaller pieces obliged. The ball hit just below where the stone had pierced and for a moment it looked like all it had achieved was to create a second hole, but then a bulge appeared in the stone between the holes, and, moments later – and without need of further ironshot – the wall came tumbling down. Unsurprisingly a great cheer went up along the line at the sight of the breached defences. Granite Breakers’ chief gunner gave these events a little thought and came to the conclusion that the wall had fallen so quickly due mostly to his own gun’s contribution, but that his shot had been aimed slightly out and failed to deliver maximum force, which is why the other machines’ efforts had been required for completion of the task. This did not satisfy him at all. The cannon imperial had already been shifted to aim at another wall – thus the delay in its second firing – so now, using a two-handed mallet, he knocked out one of the four large iron wedges at the breech to lift its muzzle a little and thus alter the flight of the next path. He had measured everything previously with his sight and level, involving much effort in the placing of the instruments on top of the behemoth and the application of considerable mathematical expertise. Now, however, having gained the practical experience of witnessing a shot in action, he had a better feel for the work. Besides, his dissatisfaction had turned into impatience, and he wanted to prove the cannon imperial’s true worth. … then with considerable trepidation, lowered the burning end of the match-cord towards the line of crushed powder leading to the touch-hole. Just like the previous time, there was a delay as the powder flashed and the burn thrust its way down through the deep hole to the massive charge packed in the belly of the beast. This gave the engineer just time enough to spin about and descend two of the steps before the mighty boom. He hit the ground almost exactly as before, but did not attempt to climb to his feet immediately, instead turned his head to get a quick look at the walls before the smoke of the blast obscured the view. … felled with one blast. The cheering renewed before even having died away, now growing even louder than before. 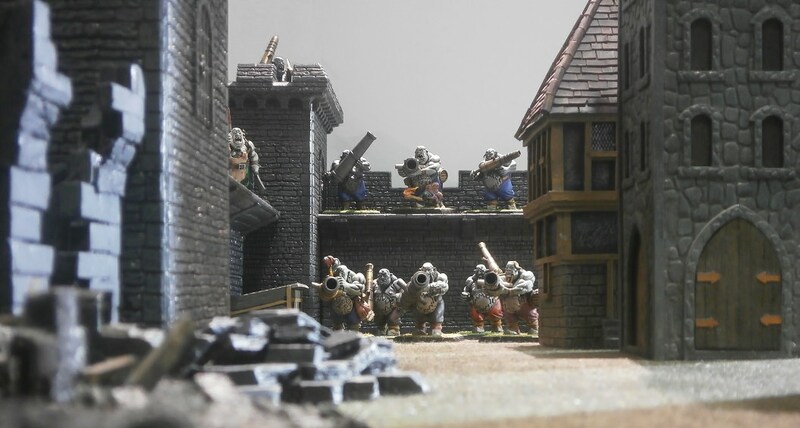 The third cannon chipped at the tower, and although the bolt throwers could not perfect their aim against such a concealed foe, the crossbow dwarfs killed one of the Maneaters. What had seemed an almost impossible challenge to the attackers was now beginning to look like a distinct possibility - they could win this battle. 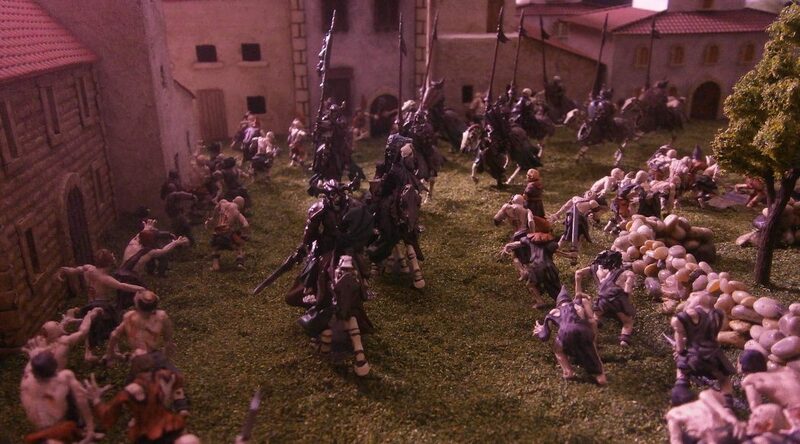 The assaulting army was drawing near, and the defences were breached in not one but two places. 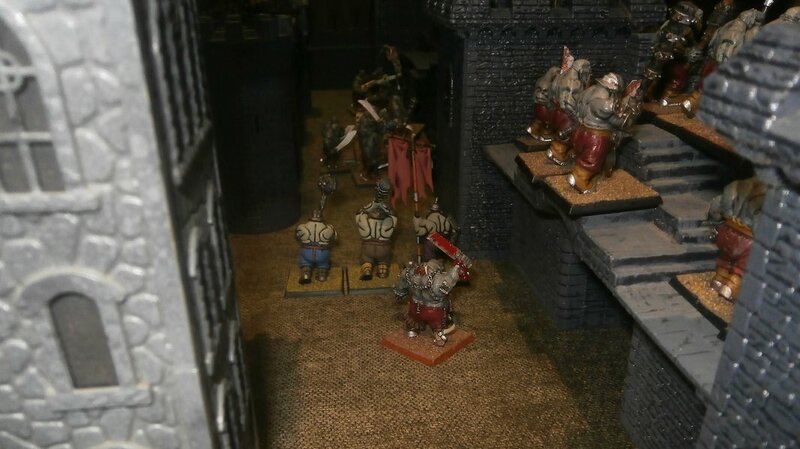 The Ironguts now raced up towards the breaches while a second body of ogres reformed behind the ruins of the wall they had once occupied. The two Slaughtermasters, despite knowing they needed their magic to bite, failed to conjure anything that could harm, or even simply slow down, the foe. The Maneaters, having spotted who was responsible for their mate’s demise, blasted everything they had at the maiden Perrette, but such was their fury that it ruined their aim! 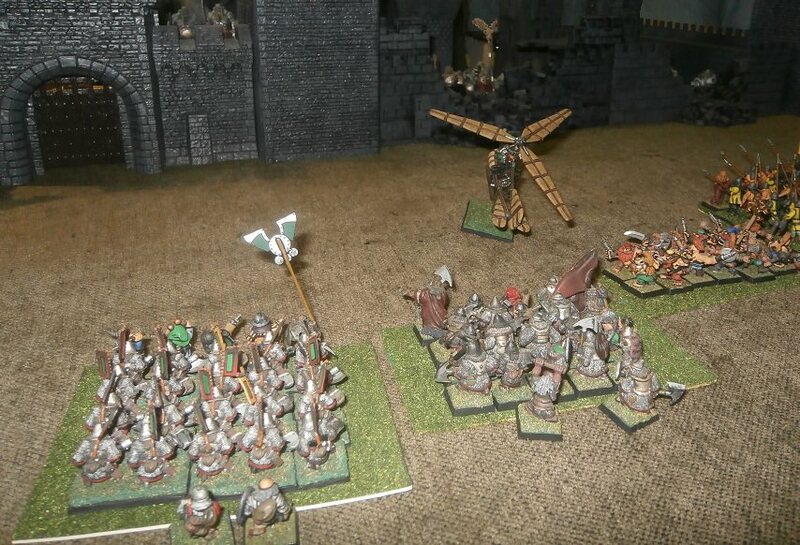 The three companies of leadbelchers spread their efforts more widely, killing three Brabanzon spearmen, two dwarven thunderers and damaging the flying machine. None of this was sufficient to dishearten the assaulting army, and so on it came. 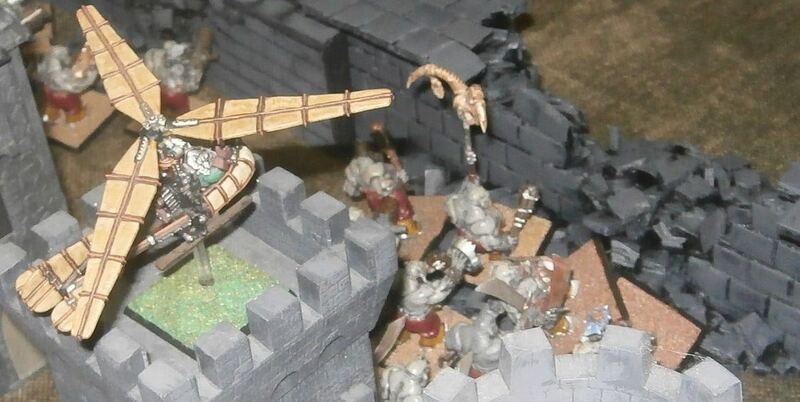 Damaged, but still able to fly, the dwarven flying machine now crossed over the walls, dropping its bomb as it passed to bloody the bulls below. Turning abruptly, it came to a halt atop one of the city’s inner towers, where the pilot leaned and twisted all ways to assess the damage received. Perrette had just as little luck as the Slaughtermasters with her own attempts to summon up magical harm, her concentration being jarred both by her wound and the cacophony of noise, what with cannons booming and walls collapsing close by. … the attacking army shot everything it had at the walls. Granite Breaker caused the tower by the gate to collapse partially, while one of the smaller cannons wounded the slaughtermaster upon it, as well as one of the Maneaters with him, bringing down the parapet to boot. This sudden removal of the stone hiding the maneaters gave several others an unexpected opportunity, and although the bolt throwers both missed, the dwarven crossbows killed another of the veteran brutes. The third cannon could only shake the tower once more, while the trebuchet landed a stone upon the bulls nearby, bloodying one of them. The crew of the Brabanzon’s little piece joined their fellows’ efforts, yet only managed to bury their shot into the ground before the walls. The largest of the bull regiments now argued whether they should sally out or not, in the end simply standing their ground out of an inability to decide. Behind them Wurgrut was not so hesitant and tore down the towers stairs to run out onto the street. The enemy were getting so close to the walls that he had decided he needed to be where he could get to grips with them. While he ran he conjured chain lightning, killing a trollslayer but failing to reach any other units. From the street he threw a magical blizzard of ice shards up at the flying machine, once again damaging it. 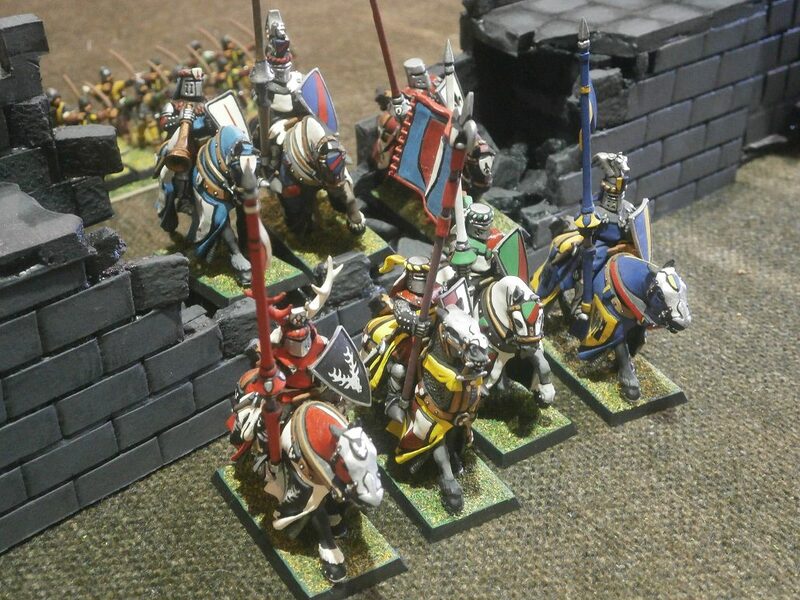 While one company of leadbelchers now brought down two of the knights riding with the young baron, the other two companies both aimed at the dwarven thunderers, killing nine of them. The remaining pair made a sorry sight indeed, but they did not run. 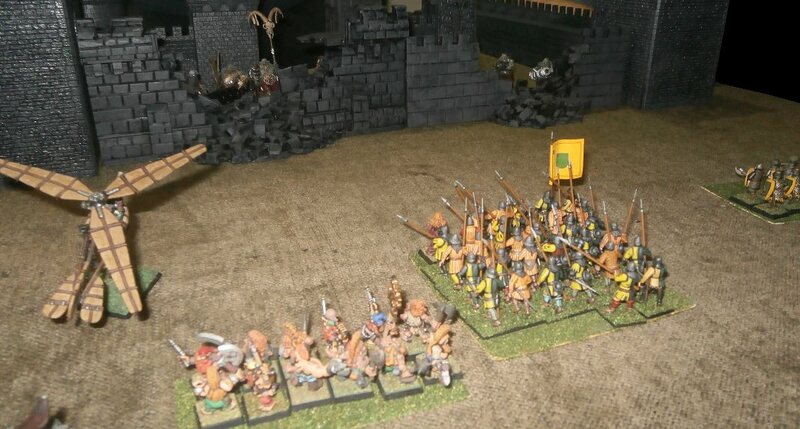 Perhaps because there was so much in front to distract them, the ogres entirely failed to notice they had left the northern wall open to the enemy’s possession, and so it was that the Brabanzon brigands, a company of skirmishing archers, threw up some ladders and occupied it. … and the trollslayers charged into the bulls. The mounted knights struck hard at the brutes, killing one and wounding another seriously, which disheartened to foe so much that they turned to flee away. They did not get far before lance points thrust deep into their backs to kill the rest of them. Such was their urge to have at the foe, however, that two knights fell in the act of simply crossing the rubble, their steeds’ legs broken. The trollslayers fought not one jot less bravely than the Bretonnian chivalry and took down two of the ogres as well as wounding a third. Moments later, however, they were all dead, beaten to a pulp or crushed under foot by foes standing more than thrice their height! While these vicious struggles were fought, Perrette poured out every fire spell she could muster, burning the bulls at the gate but failing to kill any of them. Between them the dwarven Quarrellers and one of the bolt throwers killed the last of the Maneaters, leaving the Slaughtermaster alone. For a moment he glared at the foe with hatred, then realised he had to decide quickly what to do now. 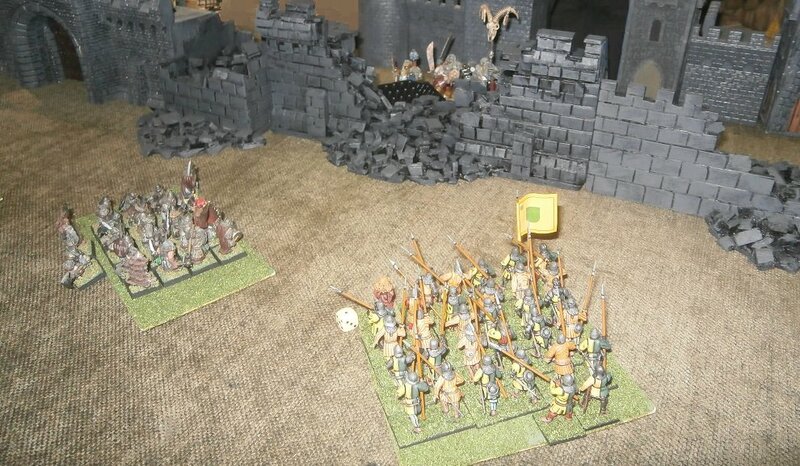 He was not quick enough, however, for the Brabanzon’s two wrs machines hit the already badly damaged tower, shaking it visibly, then, as one of the smaller dwarfen cannons misfired, the other punched so hard that at last the tower fell. The Slaughtermaster came tumbling down with it, somehow staying above the rubble to avoid any real injury, while one of the trollslayers fightingnearby was killed, just before a bull could do it! Close by, Granite breaker punched a visible hole in the wall by the gate, but as yet nothing big enough to assault through. Campogrotta’s defences were being torn to pieces! Game note: Siege games are 7 turns long, and as mentioned in the previous campaign battle report, victory conditions are all about how many sections of the defences are held by each side at the end of turn 7. 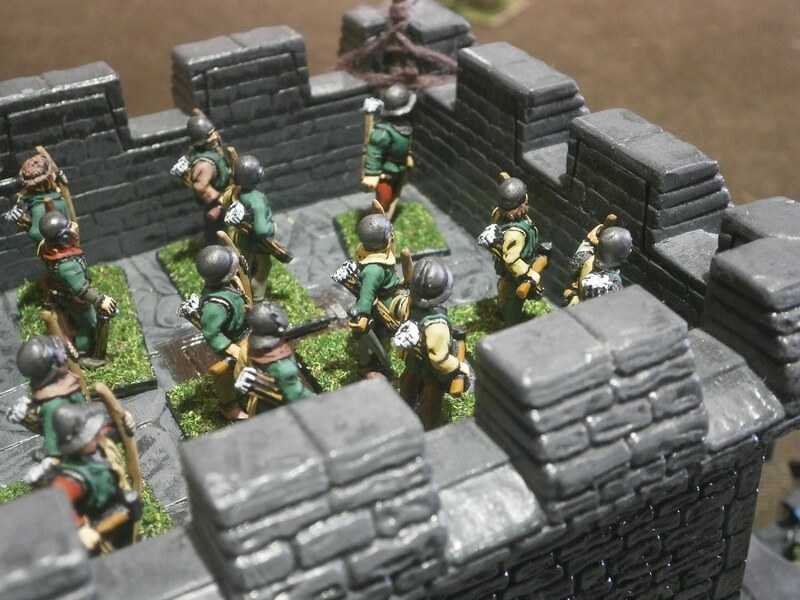 As GM I had, at the start of the game, agreed with the players that as well as the wall, tower and gate sections I had identified and numbered at the start of the game, I would count one or more units roaming freely inside of the city as one controlled section, and in the event of a draw, if an assaulting unit had passed over a section which remained unoccupied by any defenders I would also count that as a controlled section. All this meant, despite appearances, that victory was still ‘very much up for grabs’. I've finally managed to find time to sit down and read the last couple of instalments on my computer; it really is terrific what you're doing here Padre. That shot of Wurgrut on the tower really set the tone for me, great model and very atmospheric paint job. The story telling is great as always and the time you must put in is inspirational in itself! … Wurgrut himself went to join the bulls defending the breach nearest to the gate. Neither slaughtermaster could conjure anything from the winds of magic to trouble the enemy, but a hail of lead-belcher shot finally destroyed the dwarven flying machine, which tumbled down into the street with a crunch. 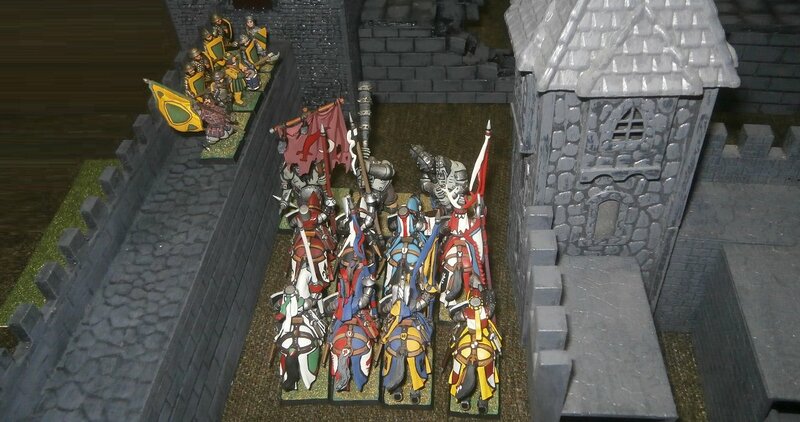 … while Baron Garoy ordered his knights to turn about and prepare to receive the inevitable charge from the Ironguts hurtling along the street behind. The damsel Perrette summoned another burning orb to throw at the enemy, slaying two of the bulls massed behind the fallen stones, just as the small Brabanzon gun felled a third. 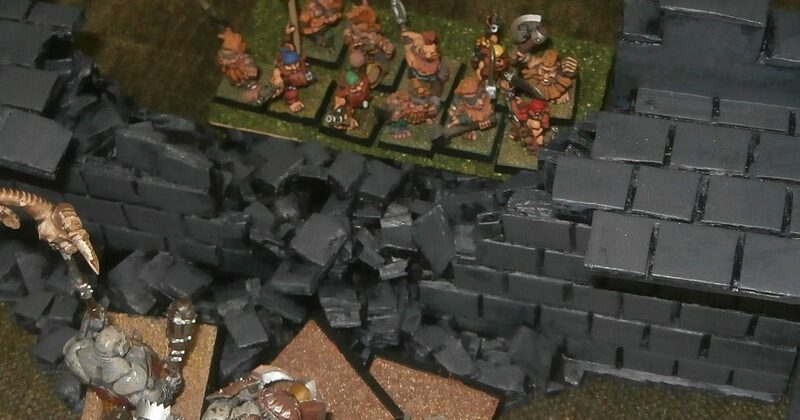 Moments later a huge round-shot from Granite Breaker caused the wall by the gate to collapse, killing another pair of ogres in the fall. The brutes’ dying cries, the foul stench of burning flesh and the sight of bent limbs reaching from the rubble only made the rest of the bulls angrier, more determined to stand their ground. From the tower’s vantage point, Wurgrut’s lieutenant looked down on the battered bulls below. This was all it took for the bulls to yield to their inbred desire for a fight, and they scrambled over the rubble to charge into the Brabanzon spearmen. The fight was quick and nasty. Lodar somehow avoided facing the bulls’ champion, and instead cut deep into the flesh of two other bulls while the spearmen’s sergeant dodged the champion’s powerful blows. Despite her injury, Perrette spun with an elegance learned from a dancing master in her youth to avoid another huge club. Had it hit, it would have crushed her entire body to a pulp. Six spearmen died, half of them perishing from the mere impact of the hulking foes, while only two ogres were slain. The Brabanzon had the weight of numbers, however, and pressed on aggressively, presenting a wall of sharp, jabbing spear tips before them. When the remaining two bulls realised their mistake, they foolishly attempted to return to the defences. They never reached them, and the Brabanzon stepped over their corpses to come right up to the rubble. Wurgrut summoned magical lightning to fry three of the brigand archers in the northern corner tower, then the arching lines of burning light shifted their fury to the men at arms approaching below, killing another four. Up on the still-standing walls and tower the leadbelchers were re-loading and firing as fast as they could, killing several of the Dwarven Longbeards and Warriors drawing ever closer to the breaches. … to begin a bout of hacking and slashing from both sides. Thick skin, metal armour and the protective blessing the knights had prayed for before the battle, all conjoined together to prolong the fight. Here and now Baron Garoy was learning what a real fight was like, and it was a lesson he embraced with open (mailed) arms! 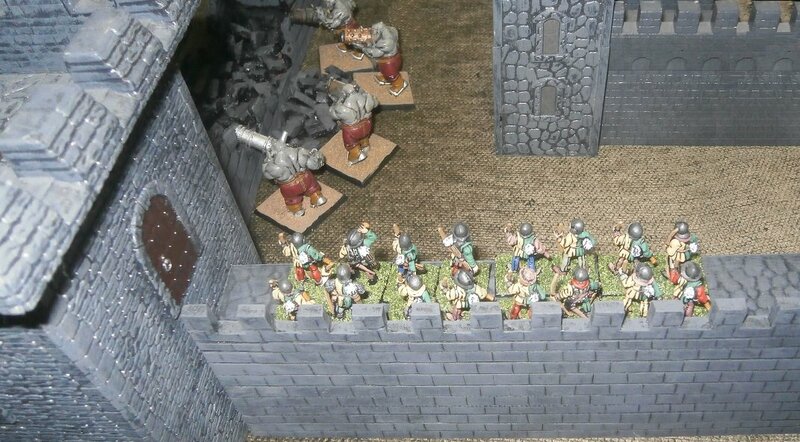 The men at arms upon the nearby wall now attacked the Ironguts’ flank, some striking down from the wall itself, and although they lost two of their number in so doing, their intervention shifted the odds significantly. When one Irongut was cut down, his blood spattering all around, the remaining pair staggered backwards, looking for a way to escape. 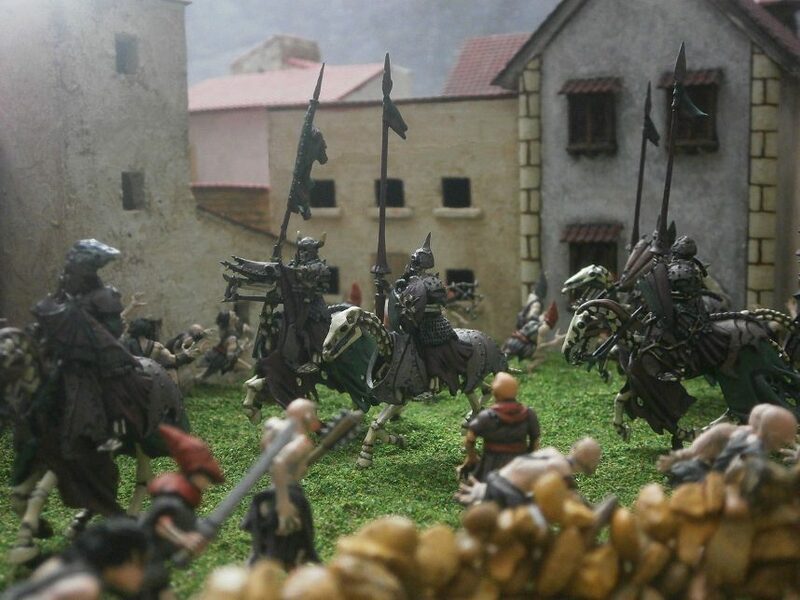 Baron Garoy laughed as he and his knights spurred their horses on to follow fast, thrusting their lance tips through the enemies’ grey flesh and riding right over the ruins back outside the city! 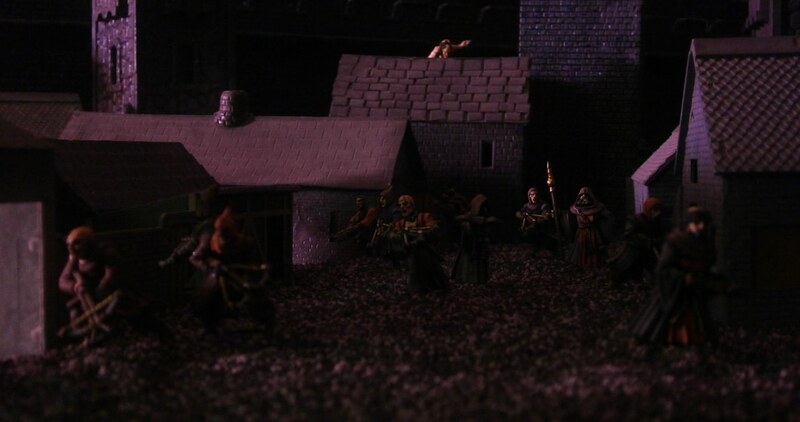 The most northerly quarter of the city was now overrun, but the ogre garrison was not yet beat. Wurgrut moved into the ruined tower by the similarly ruined gate while the leadbelchers above moved to re-position themselves all the better for the fight yet to come. Wurgrut conjured a powerful blast of wind to blow the men at arms from the wall in the north, but so agitated had he become he lost his hold on the winds of magic and allowed them to dissipate before he could spin them into a new spell. Somewhat dazed, he now watched the dwarven warriors approaching hesitantly (Game Note: Failed charge), while the Longbeards began climbing, in a similarly cautious manner, over the rubble to his left. Behind him, the Brabanzon spearmen had already entered the city and were making their way along the street running parallel to the wall. A stone from the trebuchet landed amidst the remains of the last regiment of bulls, killing another of their number, while the rest of the allies’ artillery merely chipped grey stone and bloodied grey flesh here and there. Granite Breaker’s huge ball ploughed deep into the earth, whilst the score of quarrels that clattered all around Wurgrut merely nicked and pricked at his grizzled flesh. Game Note: This was the end of turn 7, thus the end of the game. According to the siege game rules, based on the relative numbers of wall and tower sections controlled by each side, the result was a draw! Neither a minor victory or victory. This meant that the next campaign turn – which will be turn 1 of the next season, Autumn IC 2403 - the besiegers would still be attacking, and the defenders would still be defending. Of course, if I just stopped the story at this point it would be a VERY odd ending, as the attackers look very much to have the upper hand. If they simply carried on as they were already doing victory would almost certainly be theirs. But ‘rules is rules’, and my players are playing competitively, which in turn drives the campaign’s story. Both sides knew the victory conditions and had been playing to achieve them. And so I was now left with the need to write an at least vaguely convincing story ending which explained the fact that the attackers had failed to take the city, thus prolonging the siege. Here is that story ending. … watching as their Brabanzon comrades made their way down the street below. They could see also that the dwarven Longbeards were clambering across the tumbled-ruins of the wall. Immediately below them the young baron led his knights back over the ruins a third time to re-enter the city, their mounts bucking and rearing at being forced yet again to traverse such precariously difficult ground. 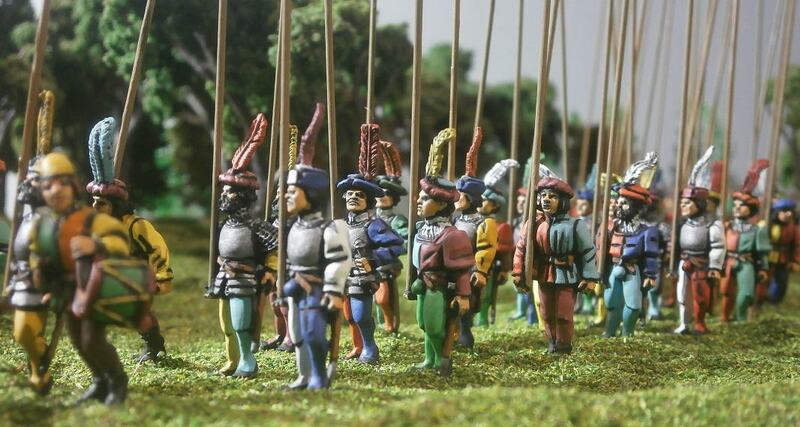 One by one, however, the brigands realised something had changed – the artillery had fallen silent. They turned to look across the field before the walls and could see the guns were still were they had been, with full complements of crewmen. They were not being troubled by attackers. They had ceased firing for some other reason. Perhaps, suggested one of the brigands, they don’t want to harm the soldiers now entering the city? Or, said another, maybe they have run out of powder? The truth was that the cannon imperial’s chief gunner had commanded a cessation in firing. There had been something about the sound of the last shot and the gun’s bucking, shaking movement in so doing, that concerned him. Something was not quite right, which foreboded ill. The ancient gun had done good service, and no doubt if she were to continue in like manner, she could take down the last of the city’s eastern defences. But he had not liked what he had seen and heard, and a torrent of thoughts were now tumbling through his mind. He was not at all a superstitious fellow, so his concerns all had a very practical bent: Had the tarnishing of the barrel over the years somehow weakened it - either its bronze fabric or the runic wards protecting it? Was the powder they were using too potent compared to the ancient powder Granite Breaker's barrel was forged to withstand? Had the journey down the road weakened the carriage dangerously so that the next shot would bring ruin to both the great gun and those who tended her? He would not risk it, and so had signalled a stop with a crossed sweep of his arms. Inside the city Perrette and the men she was with suddenly came to a halt. 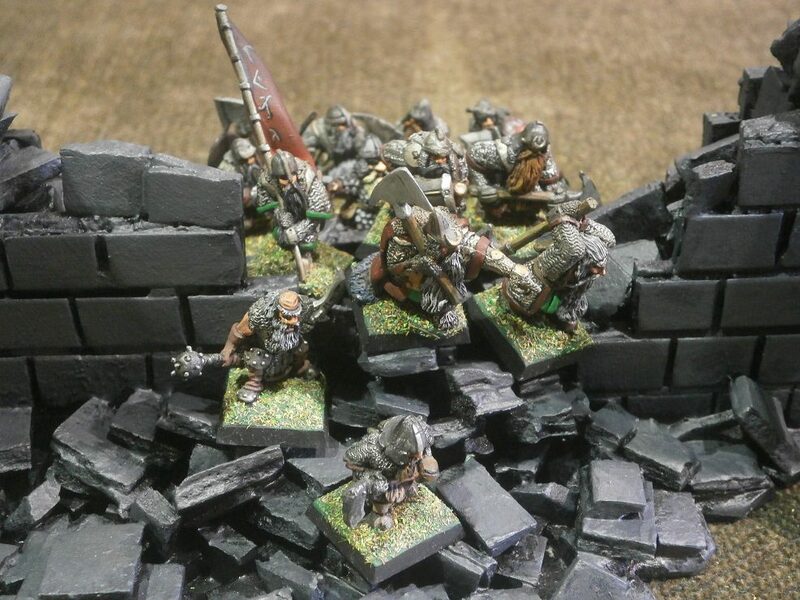 Before them was a sight that sapped every ounce of will they had to advance any further, and they could clearly see the dwarven Longbeards who had been climbing over the rubble ahead were of a like mind. 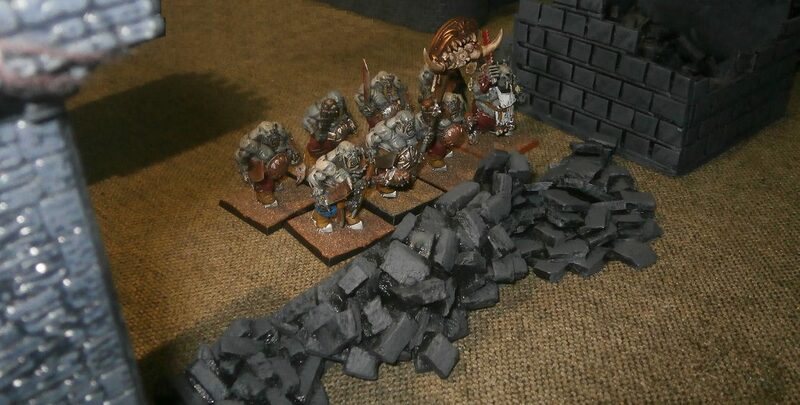 The last few of the ogre bulls up ahead had fallen back from the wall, moving a little way down a street leading away from the wall. In so doing they had revealed the brutes further on, each and every one clutching a cannon barrel, standing ready to fire. To approach any closer, down such a narrow, stone street, would surely mean certain death. Men and dwarves halted, while the enemy watched and waited. One Longbeard scrabbled back to see why the artillery had ceased its efforts, while the Brabanzon spearmen shouted up to the brigands behind to ask what had happened. 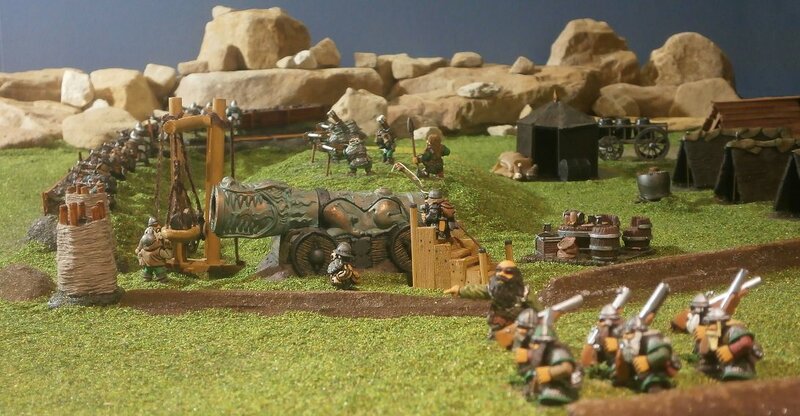 Within moments, both men and dwarves realised that there would be no further barrage to blast the walls and towers beside this monstrous battery of barrels. Perrette studied the enemy through narrowed eyes, knowing she had no more magic in her. Her rage had been transformed into fear, and the loss of blood from her wound was beginning to make her feel faint. The soldier by her side dropped his spear to take a hold of her instead. Up ahead one of the brutes was smiling cruelly. With one hand raised he crooked a finger to beckon them on, while in his mouth he held a smouldering match dangling over his piece’s pan. 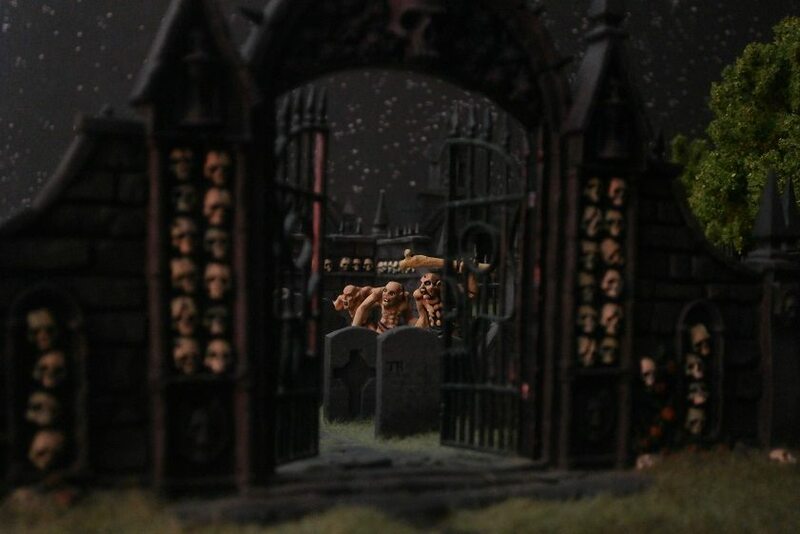 “In the morrow,” came a cry from the dwarfs, who began to back away. This was all the Brabanzon needed to make up their mind, and they too left, scrambling as fast as they could over the fallen masonry and between the ragged edges of the torn walls. Before long all the other attackers had left the walls, towers and streets also, to return to the siege lines. They knew had the right tools for the job. They simply had to wait until the time was right too. Thanks Shaun. Can't wait for the next battle, but for now a big report regarding just about everything! Another fantastic chapter; love these in universe accounts and the miniature photography only gets better. Excellent stuff, this is the gold standard to which I hold narrative campaigns. Also, have you read the novel Q by Luther Blissett? A lot of these passages give me vibes of that book. @ GhostClown: I do have the book and a long time ago started reading it. But I stopped, and I can't remember the reason. I will try to find it on my bookshelves. Was it originally not in English and translated? Or am I thinking of another book? It was written by a group of Italian authors, so yes I think it did have to be translated to English.